YOUNGSTOWN, Ohio – The former Faith Chapel Fellowship in Salem will soon have a new congregation: day care children. Leslie and Jeff Schreiber closed last month on the property at 511 E. Pershing St. to house their Small Wonders Discovery and Learning Center day care which also has sites in Leetonia, Greenford, Columbiana and Canfield. The Schreibers paid $190,000 for the 5,880-square-foot Faith Chapel, which was in bankruptcy. It was important to the Schreibers to do something with the church that was built in 1945, because they know people who used to attend, Jeff Schreiber says. “We’re at least using the building and keeping people coming in and out,” Schreiber says. In recent years, declining attendance at religious services has affected the viability of houses of worship in the United States. In September 2018, Gallup reported only 38% of adults said they attended religious services weekly or almost every week, down from 42% in 2008. Compare that to the 48% who say they seldom or never attend, up from 45% in 2008. Dwindling congregations mean less money coming into the churches for maintenance and upkeep, which has forced denominations to downsize and either sell the properties or leave them vacant. This has created new opportunities in the commercial and residential real estate market for investors willing to take a leap of faith. A decade ago in Ohio, it was common for vacated churches to be torn down, says Anjanette Frye, president of the Ohio Association of Realtors. Today, they are being repurposed. Popular uses include single or multi-family residences, she says, while churches abutting commercially zoned areas are being used for business purposes. Churches that are 70 to 90 years old are particularly popular because of the architectural work that went into them. Features such as the woodwork, stained glass, gold leafing, flooring and marble attract buyers, as do the vaulted ceilings, open floor space and price point, Frye says, the latter of which depends on the location. Churches in areas of revitalization can go for $110,000 to $250,000, while those in more established, affluent areas can fetch as much as $500,000, she says. There is a growing market regionally for former houses of worship as long as the buyer has a use, whether commercial or residential, says Jeff Byce, auctioneer, broker and appraiser at ByceAuction. In most cases, the property is for sale because of “functional obsolescence,” he says. For some popular uses, such as senior living centers or recovery homes for addiction treatment, renovations include insulated stained glass windows and addressing any problems posed by asbestos. Older churches might have asbestos in the plaster or wrapped around the pipes of old boiler systems, he says. Many of the church properties that Byce sells “tend to be distressed,” and buyers need to consider how long a building has sat vacant. Walls crack, older plumbing can lead to major water breaks that go undiscovered, and vacant buildings can be targets for vandalism and theft, he says. Turning off the heat creates issues as well. ByceAuction of Youngstown has managed the sale of several churches in the region, including the Faith Chapel for Small Wonders daycare. In 2016, the Schreibers purchased a Jehovah’s Witnesses church at 603 W. Park Ave. in Columbiana for $125,000, and spent another $30,000 in renovations, Jeff Schreiber says. Provided all goes well with renovations and applications for change of occupancy with the state, as well as a license to operate the daycare in the space, Small Wonders in Salem will be operating by March, he says. In 2017, Byce helped sell the former St. Michael Byzantine Church in Newton Falls in the $150,000 range, he says. The sale did “fairly well” because it was built in the 1960s on more than 15 acres in a multi-family residential zoned area, and had a separate residence and five-car bus garage, he says. “To me, it was a little less functionally obsolete because it was on one level and it wasn’t as old,” Byce says. In 2010, the St. Mary & Joseph Church, formerly operated by the Roman Catholic Diocese of Youngstown, sold for around $125,000, he says. Other churches Byce has sold include Christ Our King Catholic Church in Warren, Buckeye School and Word of Grace Church in Youngstown, First United Methodist Church of Mineral Ridge, The Calvin Center and the United Methodist Community Center in Youngstown. New investment is making these properties “more valuable and more viable,” Byce says. Younger buyers and investors are showing more interest in church buildings as well. Byce cites Noble Creature Cask House, which operates in the former Butler Memorial Presbyterian Church at 126 E. Rayen Ave. in Youngstown. The church is smaller than some of the other church properties in the area, making it more manageable, he says. 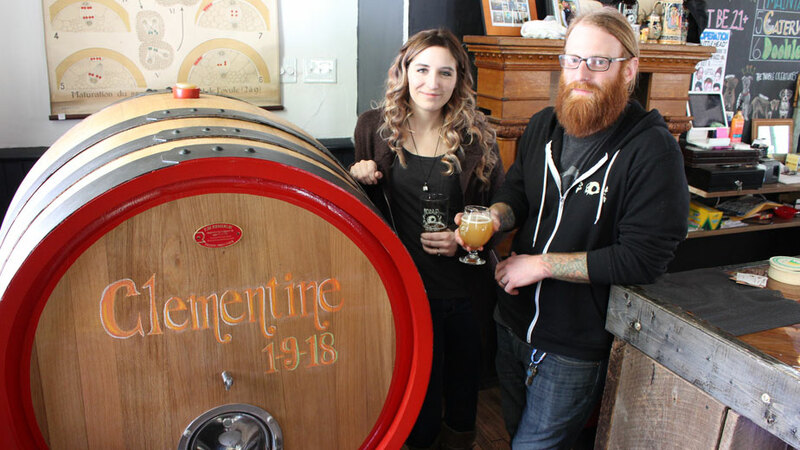 Noble Creature leases the property and has spent some $250,000 thus far in renovations and brewing equipment, says Ira Gerhart, brewer and co-owner. Upgrades included widening the rear entry door to move in the equipment, pouring concrete in the basement and repurposing its original hardwood oak flooring for the bar and tabletops in the tap room, new plumbing and electrical work and installing a deck with a handicap ramp for compliance with the Americans with Disabilities Act. Renovations began in November 2016 and were completed the following August. As they were doing that work, Gerhart and his wife, Marcy, reached out to other churches and schools in the area to ensure they were OK with the project. Marcy and Ira Gerhart lease the former Butler Memorial Presbyterian Church in Youngstown. They opened Noble Creature Cask House in December 2017. Noble Creature opened in December 2017. Byce predicts older, existing structures will become more attractive for buyers as real estate becomes more expensive, he notes. Repurposing a church does present challenges, however, and Byce advises caution. Buyers need to care for the land, reassess taxes, buy insurance for the building and property and handle upkeep costs for utilities and maintenance. Most are in residential areas, so buyers will need to obtain proper variances to use them commercially, he says. In addition, certain denominations have restrictions on how the building may be used. Roman Catholic churches, for example, typically have deed restrictions factored into the contract that outline what a buyer is permitted to do with the structure. When a Roman Catholic church is vacated, it is desanctified, artifacts are removed and it is no longer a valid worship site, says Patrick Kelly, chief financial officer for the Youngstown Diocese. However, deed restrictions on record with the county auditor prevent it from being used for any “sacrilegious purposes,” he says. Kelly acknowledges this can make it difficult to sell a vacated church. Some prohibited commercial uses include retailers of pornographic material or sexually oriented merchandise, massage or tattoo parlors, pool halls, pawn shops, breweries and bars, restaurants that sell alcoholic beverages, night clubs and dance halls, cinemas, skating rinks, bowling alleys, flea markets, gambling parlors, firearm retailers, telecommunications towers, and any health-care providers that are contrary to the church, such as abortion, contraception, assisted suicide, in vitro fertilization and stem-cell research. Owners who violate these restrictions could be open to a civil lawsuit, says Denise Glinatsis Bayer, attorney at Harrington Hoppe & Mitchell in Youngstown. Changes to the deed restrictions require written authorization from the bishop, who titles all churches in his diocese, she says. 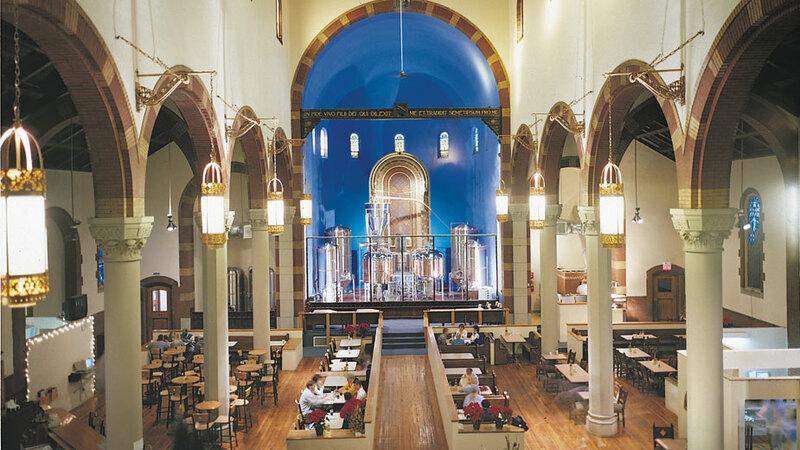 The former St. John the Baptist Church in the Lawrenceville neighborhood of Pittsburgh had no such restrictions when Sean Casey purchased it in 1995 and converted it into the Church Brew Works, he says. At the time, the Catholic Diocese of Pittsburgh and its bishops worked with Casey on the transaction and supported the project, he says. The only caveat to the agreement was that Church Brew Works needed a restaurant license, he says. However, he recently purchased the former St. Kieran church in Lawrenceville, which does have deed restrictions, he says. Ultimately, he says, it comes down to the diocese leadership and what the bishop takes offense to. Leadership in Pittsburgh has changed since he purchased St. John the Baptist church. The altar at what was St. John the Baptist Church in Pittsburgh is the focal point at Church Brew Works. Casey plans to repurpose St. Kieran church as condominium-style residences, he says. For both projects, Casey held meetings with diocese representatives and community members to discuss his plans and engage the residents. Currently, deed restrictions are standard practice in the Pittsburgh Diocese, as are removing all religious items, including statues and windows, says the Rev. Nicholas Vaskov, executive director of communications for the diocese. Other Catholic churches-turned-businesses in the diocese include Mr. Smalls, a concert hall operating in the former St. Ann’s Catholic Church in Millvale, and the now-closed Altar Bar, which operated in the former St. Elizabeth Church in Pittsburgh’s Strip District. In 2016, the space was sold to the Franklin Park-based Orchard Hill Church. Not all denominations have such restrictions. There are no hard rules when it comes to Presbyterian churches, says the Rev. Cathy Ulrich, general presbyter and stated clerk for Eastminster Presbytery, Mineral Ridge. Administrative commissions elected by a presbytery handle the closing and liquidation of Presbyterian churches, which are held in trust for Presbyterian Church (U.S.A.), she notes. Eastminster is the regional governing body of the Presbyterian Church in northeastern Ohio that encompasses Mahoning, Trumbull, Columbiana, Portage and Summit counties. At present, none of the 45 churches in the presbytery are for sale. The administrative commission for the former Coitsville Presbyterian Church at 91 Coitsville-Hubbard Road was dissolved after the church was closed, and Platz Realty Group is handling the sale of the property. It’s listed on LoopNet at a sale price of $300,000 for the 10,000-square-foot building and three-acre lot. The former Monroeville Assembly of God church at 6615 County Road 55 in Salineville would be ideal for residential, says JoAnn Clark, agent with Cutler Real Estate. Clark works out of the Carrollton office of the Akron-based agency. It’s listed at $79,900, down $20,000 from its listing price in early December. The owners are “pretty motivated to get this sold,” and the property has no deed restrictions, Clark says. So far, she’s had two interested parties, one looking to establish a congregation there and the other looking to convert it into a house. 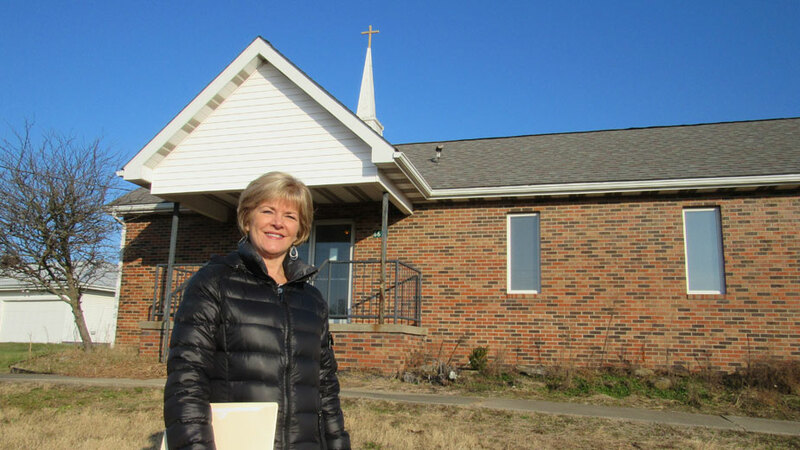 JoAnn Clark of Cutler Real Estate says the former Monroeville Assembly of God church in Salineville would make an ideal residential property. Converting to residential would require remodeling one of the two half-bathrooms into a full bath and expanding the kitchen, she says. The roof and insulation are “all in great condition.” And the large worship space “would be a perfect open-floor concept,” she says. The property has been on the market a year. Not all churches are repurposed. Some are torn down so the church can sell the property, says Kelly of the Youngstown Diocese. Others are kept within the church to use for special occasions, he says. In May, Bishop George Murry announced reconfiguration plans to reduce, over two years, the number of parishes to 87 from 115 in the diocese’s territory, which includes Mahoning, Trumbull, Columbiana, Stark, Portage and Ashtabula counties. The diocese sold the former Immaculate Conception Church, along with its rectory and school, 811 Oak St., to Christ Centered Church, which in turn sold it to the city of Youngstown for $50,000. Byce handled that sale and, in October, the city approved the purchase and scheduled the buildings for demolition so the land could be used as part of the $20 million Chill-Can plant under construction by Joseph Co. International. Pictured: Jeff and Leslie Schreiber bought the former Faith Chapel Fellowship in Salem for the next location of Small Wonders Discovery and Learning Center.